I’ve always loved makeup, since I was little, but I wasn’t allowed to wear it until I got much older of course. So basically, I started wearing makeup when I was able to buy it on my own as a teen. This did not give me very much makeup at all. But long story short, I had to choose where I put my makeup dollars very wisely. In doing so, I learned a few tips about makeup buying that have stuck with me till this day. The most important thing I learned was that it’s all about money the majority of the time. And because of that, it’s no secret that there’s a lot of things out there that are priced ridiculously. Here’s the worst part: Sometimes what you paid $$$$ for is the fundamentally the SAME thing as what is sold somewhere else under a different name for $. A lot of the time, formulations of certain types of product are basically the same thing, but just sold at different price points. You know, it’s the same thing for almost every type of consumer product. You can relate this to the health field as well. For example, over the counter medications. Trade name vs generic. Ibuprofen vs Advil. Tylenol vs Acetaminophen. Some people think that it being a brand name makes it better. Um. No, its the same stuff. Does the same job for most people, and there is a BIG difference in pricing. Now nothing is completely black and white, there is some gray area, and much of the time as well, you get what you pay for. You just have to know the difference and know how to put your dollars where it counts. Trust me when I say, I think mascara is one of the biggest costs in a makeup collection. Maybe not off the bat, but it adds up! Big time! Especially if you’re buying one for over $20. Think about this: It only lasts about 3 months before you should toss it. And that’s if it doesn’t dry out before then. Not only that, but formulation wise, a lot of them are the same stuff. Just sold under different brands. I honestly don’t feel like any high end mascaras have ever done anything for me that a drugstore alternative can’t do. And I should know, because I have teeny tiny, baby fine lashes that need a lot of help. I go through mascara like nobody’s business. Pick a type you like (waterproof, volumizing, lengthening, gel, whatever) and find your drugstore twin of that formulation. Save your dollars for something pretty (or just save them). Everyone knows and loves the Beauty Blender. If you don’t, you will be amazed when you see what it can do. Until fairly recently, this would have been on my splurge list because once upon a time it was worth it since there wasn’t really anything like it that give you the same finish without sucking up all your product into the sponge itself. But there are actually good alternatives now to that little $20 miracle worker. The Real Techniques Miracle Complexion Sponge is less than half the price and a pretty good dupe. This product really depends on the person I think. There is no question that this stuff should be changed often as it can get icky fast, and you really don’t want to risk putting funky liquids near your eyes. Aside from that though, some people will swear by some of the high end stuff. I’m am not on that bandwagon. I have mastered using liquid eyeliner to the point that I can make it work with any applicator I have. I’m very proud of how far I have come (used to be terrified of the stuff). And I choose to have the cheap ones from my beauty supply store. Lol. There’s lots of options at the drugstore too and I think it’s all about the applicator, because once they dry down from their liquid state, they all look the same. Once you find the right kind of applicator, it’s smooth lining from there…without the hefty price tag. Seriously, you can get this at the dollar store. It will do the job just fine! No need to spend anything close to $10 or more. If you are worried about your cuticles drying out, then put some Vaseline or some oil around your cuticles before you start removing. And if you feel like it’s not coming off fast enough, here’s a little salon trick: Once you soak the cotton in the polish remover, place it on the nail and leave it there for a 30sec or a minute, then rub once and the polish comes right off. Most people rub the cotton over the polish thinking that it works faster but just leaving it there to soak off the polish for a while is much easier and requires less work. I used to waste so much money on this stuff before. And some of them don’t even work that well, you still have to add makeup remover to do the job properly. Just get the cheapest one and add some baby oil or Vaseline to help, save on the wipes and the additional remover. Or better yet, just use cotton rounds and skip the wipes completely if you can. I don’t use either of them at this point in my life (though I might start soon, I don’t know). But I was told by one beauty consultant who I know very well and trust that there is almost no difference in the super expensive types vs the ones in the drugstore. Same active/main ingredient: Retinol. He told me that a lot of people don’t even report a difference when they switch to a cheaper alternative. I will list things, I think are good to splurge on now and again. Of course I think there are great drugstore options of virtually every piece of makeup, but with these, I get it, and I may even pick up on these products as well and go high end. They tend to be long lasting and maybe even resistant to picking up germs which is also a good thing. In both powder(foundation) and cream/liquid form. It lasts long and really makes a difference in how your makeup looks and lasts throughout the day. These formulations do tend to differ greatly so I don’t feel like I’m being cheated by vastly different price points. I would splurge on a nice foundation that works for my skin and has staying power for my oily issues. 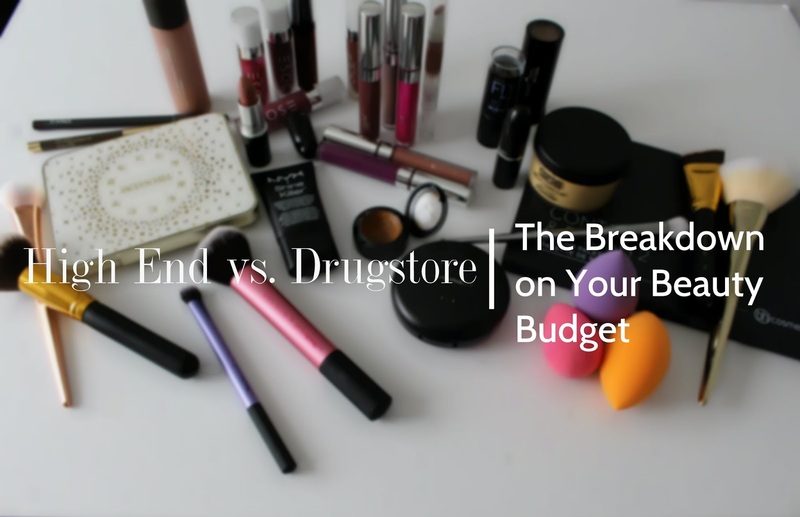 But I do have a less expensive drugstore option as well for everyday use and tend to save the good stuff for occasions. Thankfully the drugstore does have amazing options when it comes to foundation for every skin type. I would, and have spent big money (in my opinion) on these, and I’ve tried the drugstore options. So I have to say, it makes a big difference. Urban Decay is my GO TO for setting spray and primers. I don’t know too much about what’s in it. But its magic. Magic that my drugstore options can also perform, but just a little less convincingly. I’ve mentioned how much I love my Urban Decay Primer Potion. I know there are other primers that work well, but when I want a no-fail possible hold on my eye makeup, this is where I go. It helps that a little goes a long way and it lasts super long. Worth it in my opinion! I hope this was helpful to someone who wants to save a little bit! There are plenty of options out there that are lighter on your wallet, but I think some things are just nice to spend on, of course. WHAT DO YOU SAVE/SPLURGE ON?